Prairie Hollow Farm - What's Happening Pam just published a book for Farmers Market vendors called Behind the Table. The book covers everything you need to know to have a successful farmers market experience from choosing a market that fits your product, to making sure you have all the licenses you need, to calculating what it will cost to produce and market your product, how to price your product, how to set up your stand, and lots of other details that a market vendor needs to know. Single copies of the book are available at Amazon.com and volume discounts are available for 10 or more copies if you purchase directly from us. We are offering a new CSA share to folks in the Pine Island area. We have teamed up with Tulips & Truffles to offer a Food and Flowers CSA share. Each week in addition to a box of delicious vegetables from Prairie Hollow Farm, participants will receive a lovely bouquet of flowers.For more information, ask for The Food and Flowers CSA share flier when you contact us. Pam has started a blog on how to grow and prepare veggies; check it out at http://www.growitandeatwell.com/﻿! Check out Bethany's nature blog at https://bethanybenike.wordpress.com/2016/04/16/canoeing-schmokers-channel-part-i/﻿ (https://bethanybenike.wordpress.com/﻿). Pam's grandchildren are still helping on the farm. Tony, Nate and Abel are helping weed in the greenhouse. (Abel is using pliers to pull weeds!) The girls have been helping in the greenhouse too...apparently it is exhausting work! Read our blog at http://prairiehollow.com/blog3! Now's the time to buy parsnips! Come visit us at the summer markets, get fresh produce, bread, and cheese! 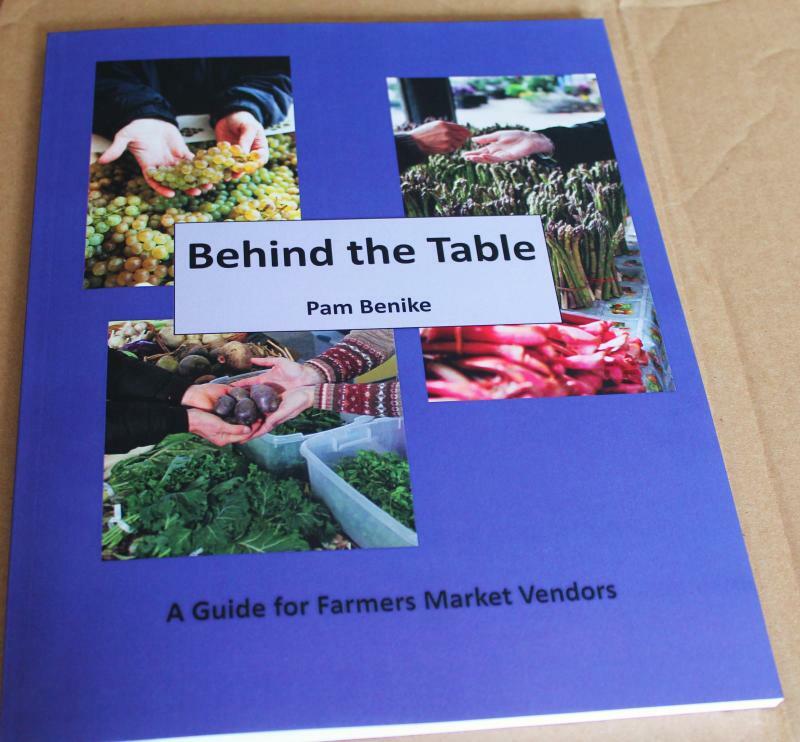 Pam just published a book for Farmers Market vendors called Behind the Table. The book covers everything you need to know to have a successful farmers market experience from choosing a market that fits your product, to making sure you have all the licenses you need, to calculating what it will cost to produce and market your product, how to price your product, how to set up your stand, and lots of other details that a market vendor needs to know. Single copies of the book are available at Amazon.com and volume discounts are available for 10 or more copies if you purchase directly from us. We are offering a new CSA share to folks in the Pine Island area. We have teamed up with Tulips & Truffles to offer a Food and Flowers CSA share. Each week in addition to a box of delicious vegetables from Prairie Hollow Farm, participants will receive a lovely bouquet of flowers.For more information, ask for The Food and Flowers CSA share flier when you contact us. Pam has started a blog on how to grow and prepare veggies; check it out at http://www.growitandeatwell.com/﻿! Check out Bethany's nature blog at https://bethanybenike.wordpress.com/2016/04/16/canoeing-schmokers-channel-part-i/﻿ (https://bethanybenike.wordpress.com/﻿). The girls have been helping in the greenhouse too...apparently it is exhausting work! Read our blog at http://prairiehollow.com/blog3! Now's the time to buy parsnips! Come visit us at the summer markets, get fresh produce, bread, and cheese! See us at the Rochester Downtown Farmer's Market on Saturdays from 7:30 am to noon. We will be at the ﻿Mill City Farmer's Market on Saturdays from 8:00 am to 1:00 pm. Artisan cheesemaker Pam Benike, of Prairie Hollow Farm in southeastern Minnesota, believes the quality of her aged cheddars and fresh mozzarellas is reflected in the care she takes with her land and her "girls," her small herd of Jersey cows. See complete article and video. We are now on Facebook! Like our page and post a comment about your favorite Prairie Hollow Farm product and receive a dollar off on your next purchase at farmer's market. There is still time to sign up for Summer CSA's. Copyright Prairie Hollow Farm, 2009. All rights reserved.